Summer’s coming to an end, so how about we end it with a bang? [firstpara] Here are five of the best things to check out or do this weekend. Converse throws a grand party to end the summer at the SM Mall of Asia Music Hall on May 28. Happening from 10 AM to 10 PM, it’s an all day party bonanza that’s filled with music, dancing, art and fun. Witness some of the best skateboarders show off their niftiest tricks, check out the Philippine All Stars showcase their moves, and jam with Gloc9. College basketball players will be playing in exhibition games to light up the event some more. You can even win some very special prizes if you come wearing Converse gear. So mark the date, everyone and for more info, look up Converse Philippines on Facebook. Looking for talented artists to get a tattoo from? 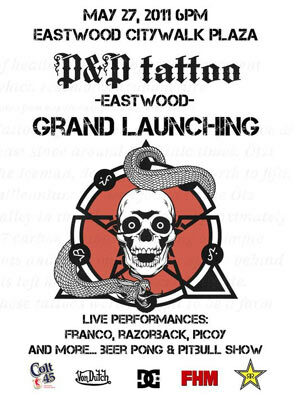 Check out P&P Tattoo over at Eastwood City in Libis on May 27 as the shop commences with its grand launch. The launch starts at 6PM, and will be greeted by performances from Franco, Razorback, Picoy and more! The shop will also be setting up some beerpong tables for those who want to play and get tipsy. Last but not the least, the launch adds another shot of testosterone in the arm with a pitbull show! Chances are some of you have gotten their salaries already, and are itching to buy somethin’ Head on over to TriNoma this weekend then as the Green Light Sale happens. Great deals and exciting perks, with discounts up to 70% await those who’ll be shopping. Wear green while shopping to get a chance to create green light graffitti at the photo booth. Shop in green and get a free Cadburry chocolate bar with a single purchase receipt of at least P1500. Use your BPI card and get a free item from Body Shop. Buy 3 tickets and get one free during the first screening in all 2D movies. The sequel to one of the most entertaining animated features is now showing. Po, that kung-fu fighting Panda, together with the Furious Five, will have his skills, resolve and courage put to the ultimate test once again as the evil emperor Lord Shen unleashes a weapon that could spell the end of kung fu in China. Fantastic stuff!